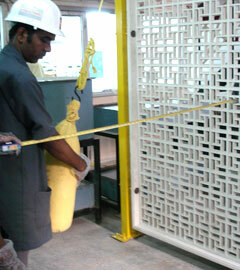 The GRC screens were tested against impact test. Normally this test was never carried out since GRC is a cladding material and it is not suppose to carry an impact. However since it was a client's requirement, this test was conducted in consultation with Glass fibber Reinforced Concrete Federation, UK (GFRC). The test was conducted using impact weight of 5 Kg , 10 Kg and 20 Kg at different height and distance. Each impact was repeated for 6 times and GRC screen was inspected after every cycle. The first impact was done with 5 kg sand bag at 0.5 m and 1.2 m from base. The second impact cycle was made with 10 kg at same high and distance. The third impact cycle was made with 20 Kg at similar height & distance. All impact cycle were successfully carried out and there was no damage observed to GRC screen.